This feature builds on the already existing compare exchange feature in RavenDB 4.0. The idea is simple. You can package a set of changes to documents and send them to the cluster. 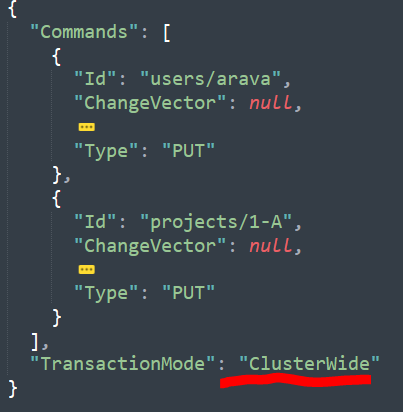 One of the major features coming up in RavenDB 4.1 is the ability to do a cluster-wide transaction. Up until this point, RavenDB's transactions were applied at each node individually and then sent over to the rest of the cluster. This follows the distributed model outlined in the Dynamo paper. In other words, writes are important, always accept them. This works great for most scenarios, but there are a few cases where the user might wish to explicitly choose consistency over availability. RavenDB 4.1 brings this to the table in what I consider to be a very natural manner. This feature builds on the already existing compare exchange feature in RavenDB 4.0. The idea is simple. You can package a set of changes to documents and send them to the cluster. This set of changes will be applied to all the cluster nodes (in an atomic fashion) if they have been accepted by a majority of the nodes in the cluster. Otherwise, you'll get an error and the changes will never be applied. Remember that I said that cluster-wide transactions build upon the compare exchange feature? Let's see what we can do here. What happens if we wanted to state that a user's name must be unique, cluster-wide. Previously, we had the unique constraints bundle, but that didn't work so well in a cluster and was removed in 4.0. Compare exchange was meant to replace it, but it was hard to use it with document modifications because you didn't have a single transaction boundary. Well, now you do. As you can see, we have a new command there: "ClusterTransaction.CreateCompareExchangeValue." This is adding another command to the transaction. A compare exchange command. 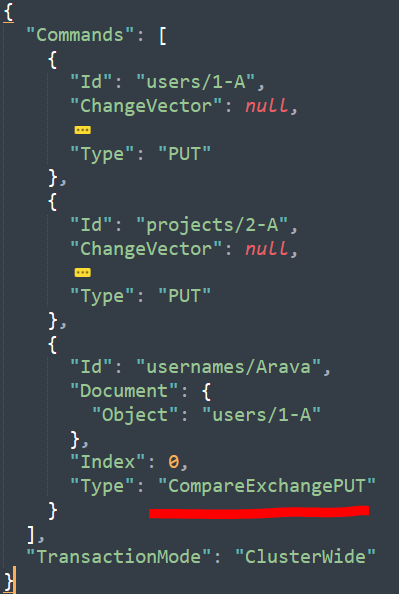 In this case, we are saying that we want to create a new value named "usernames/Arava" and set its value to the document ID. Here is the kicker. What'll happen if we run this code again? In other words, you now have a way to provide consistent concurrency check cluster-wide, even in a distributed system. We made sure that a common scenario like uniqueness checks would be trivial to implement. The feature allows you to do in-transaction manipulation of the compare exchange values and ensures that document changes will only be applied if all the compare-exchange operations (and you have more than one) have passed. We envision this being used for uniqueness, of course, but also for high-value operations where consistency is more important than availability. A good example would be creating an order for a seat in a play. Multiple customers might try to purchase the same seat at the same time, and you can use this feature to ensure that you don't double book it. * If you manage to successfully claim the seat, your order document is updated and you can proceed. Otherwise, the whole thing rolls back. This can significantly simplify workflow where you might have failure mid-operation by giving you transactional guarantee around the whole cluster. 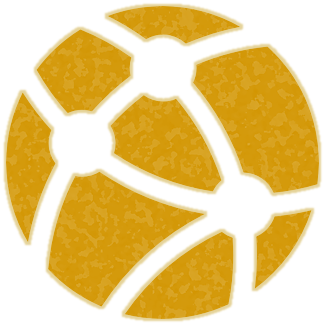 A cluster transaction can only delete or put documents, you cannot use a patch. This is because the result of the cluster transaction must be self-contained and repeatable. A document modified by a cluster transaction may also take part in replication (including external replication). In fact, documents modified by cluster transactions behave just like normal documents. However, conflicts between documents modified by cluster transactions and modifications that weren't made by cluster transaction are always resolved in favor of the cluster transactions modifications. Note that there can never be a conflict between modifications on cluster transactions. They are guaranteed proper sequence and ordering by the nature of running them through the consensus protocol. * Yes, I know that this isn't how it actually works, but it is a nice example.